A year’s worth of blood, sweat and tears has finally summed up to these past four days of the National Inter-schools Canoeing Competition. Over the past week, the Raffles Canoe team put up a strong fight against powerhouses such as Hwa Chong Institution, Anglo-Chinese Junior College and National Junior College, with a T1 boat, 2 K2 boats and 2 C1 boats making though to straight finals. 3 K1 boats and 1 T1 boat also sailed through their heats successfully to proceed to the semi-finals and bring glory to the school. The A Division team made a valiant effort from the 8th to the 11th of April at MacRitchie Reservoir. They put up a strong fight and managed to clinch many mini-victories that would not have been possible without each and every member’s indomitable spirit, hard work – inside and outside of the water – and perseverance. It was evident that every member of the Raffles Canoeing team gave their very best for every single inch in the water that totaled up to make a difference. RI the underdogs of the competition facing tough rivalry from powerhouses such as Hwa Chong Institution, Anglo-Chinese Junior College and National Junior College. However, the team was not fazed by the odds against them and they brought glory to the school by clinching several spots in the semi finals and finals. The boys paddled hard and were rewarded for their year’s worth of blood, sweat and tears. Sean Tan and Joseph made it to the guys K2 500m finals while Edgar Wang attained a spot in the C1 500m finals. The girls also put up a strong fight with Josephine Soh, Amanda Choo, Chelsea Ong and Desiree coming in 5th overall for the K4 girl’s finals. Karmun took a place in the T1 500m finals, while Sheryl Chng and Lingling managed to make it to the K2 1000m finals. 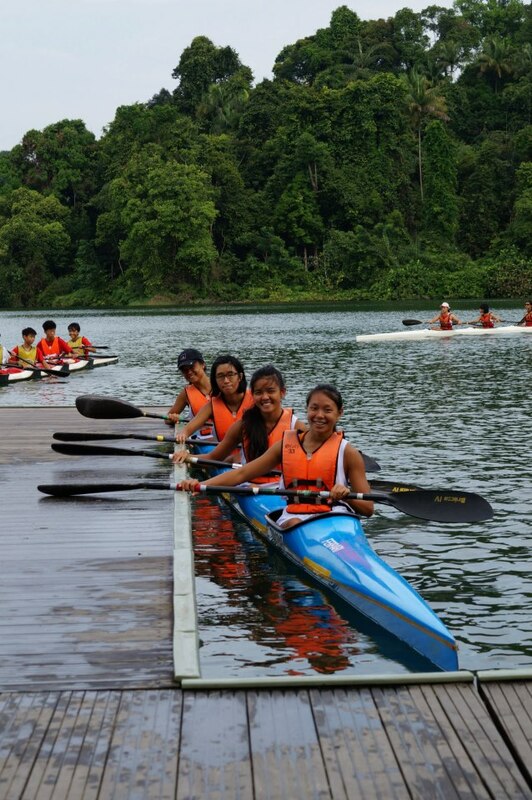 The overall performance of the Raffles Canoe team is highly commendable and they have improved from previous years. On the final day of the competition, the entire team came together as one family with one spirit to cheer their hearts out for their teammates. They were the loudest and most spirited team of all the other teams present. It was a sight that was truly unforgettable. Team captain Chester Lee said, “The frequent water training sessions, the heavy lifting in the gyms and the daily morning runs have not gone to waste. We have learnt to be tenacious, enduring and focused on our goal. These attributes are just some of the lifelong lessons we gained from canoeing. Raffles Press would like to congratulate the Raffles Canoe team on their hard fought victory. We would also like to wish all other students the best of luck during this inter-schools season, and hope to be reporting on even more success in the months to come.